DHI Global Medical Group belives in science and collaborates with international renowned scientists and professors from public European universities in order to contribute to the health and well being of all patients suffering from hair loss and scalp disorders. 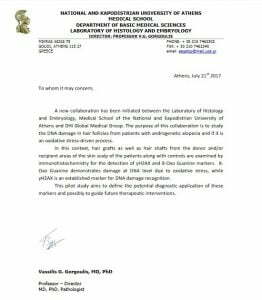 Read the following statement on the study of the DNA damage in hair follicles from Prof. Vassilis Gorgoulis (University of Athens). So far, the study has led to the new DNA Hair Biology Test which is part of the DHI Diagnostic System for Alopecia. The purpose of this collaboration is to study the DNA damage in hair follicles from patients with androgenetic alopecia and if it is an oxidative stress-driven process. In this context, hair grafts as well as hair shafts from the donor and/or recipient area of the skin scalp of the patients along with controls are examined by immunohistochemistry for the detection of γΗ2ΑΧ and 8-Oxo Guanine markers. 8-Oxo Guanine demonstrates damage at DNA level due to oxidative stress, while γΗ2ΑΧ is an established marker for DNA damage recognition. The pilot study aims to define the potential diagnostic application of these markers and possibly to guide future therapeutic interventions.